Intravenous nutrition is a method of feeding vitamins and minerals directly into the bloodstream, bypassing the digestive tract, where many nutrients may be partially or fully lost due to poor absorption. IV therapy creates higher than normal blood levels of the specified nutrients, which have been shown to be effective in the treatment of certain conditions. Intravenous infusion of vitamins and minerals can greatly enhance the treatment plan for many diseases. The IV Myers push is especially helpful for those who have a history of digestion problems. Supplements and dietary changes to help heal the gut can take time. IV nutrients can speed this healing process and give the patient the nutrients they have not been able to absorb. It's also helpful for patients who are just stressed out and run down and in need of a boost. The magnesium is calming and the B vitamins help improve energy. In addition, the selenium and vitamin C help improve a weak immune system that can often be the result of stress. 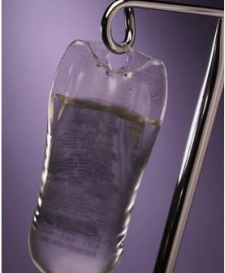 Contact Dr. Peirson if you have any questions about IV Therapy and to see if it is right for you.